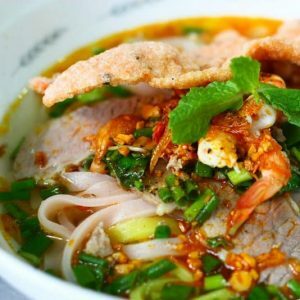 Best things to eat in central Vietnam? 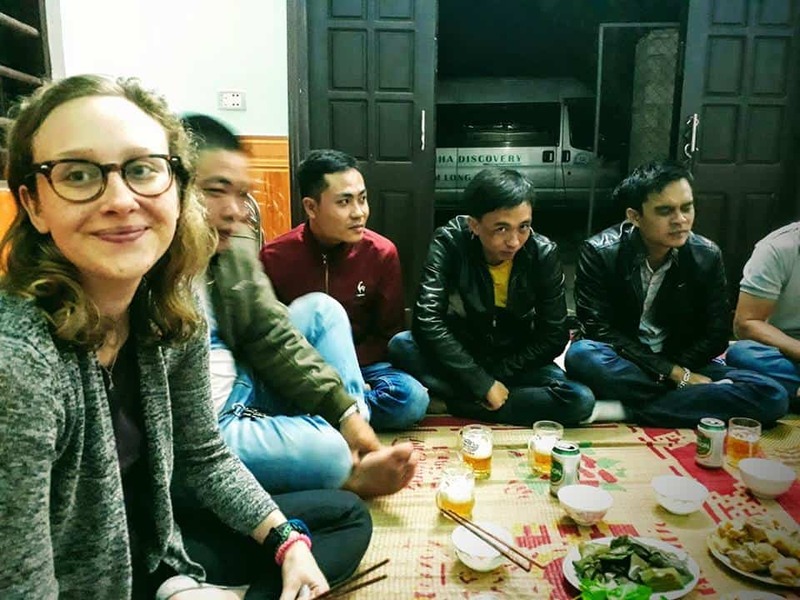 My name is Rebecca and I am the website editor for Phongnha Discovery. 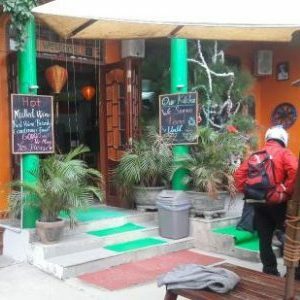 Living in Dong Hoi and throwing myself into the Vietnamese community means that I have had the opportunity to dive into the exquisite food culture of central Vietnam. I have a high standard for Pho bo (beef noodle soup) as I have learned from the best. 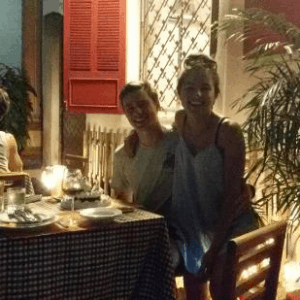 Some of the places I recommend are run by expats and boast all of the comforts of customer oriented service and standards. 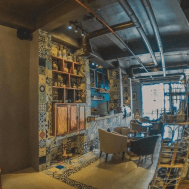 The bill will run you considerably less than at home and are enjoyed in quirky atmospheres. Some of my favourite spots may be for the brave, as they only sport a “menu” that consists of photos of food on the wall. They may require you to toss out your western standards. You may have to shout out to the servers to get what you need. Patrons throwing used tissues and food waste onto the floor to be swept up later is a common occurrence. However, the food is very much worth it. 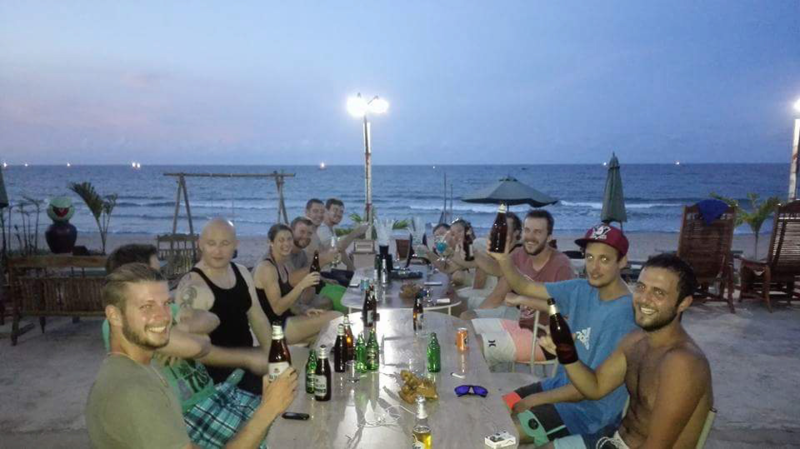 Beachside is one of the more unique establishments in Vietnam. 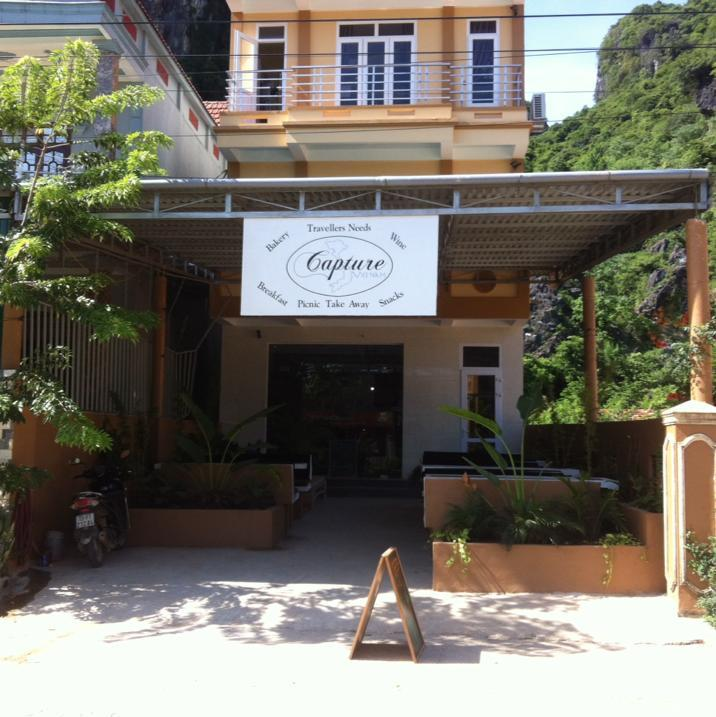 It is a backpackers hostel so the prices are reasonable. It walks right out onto a private beach. Their happy hour runs from 5-7pm with a BOGO that gets you a cold beer for less than $0.50. I would recommend the Vietnamese pancake or spicy pork dish. 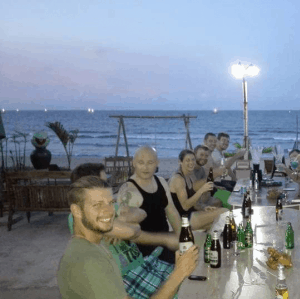 They also do BBQ’s every so often for the whole hostel that anyone can join in on. Geminai is the one place in the city you can get a proper steak frites. 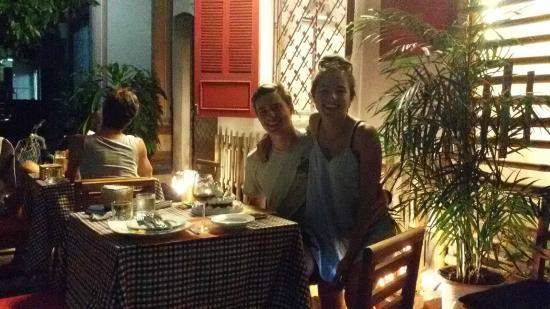 The prices run higher, but the colourful atmosphere and good food warrant the price. They also have shisha if you feel like kicking back after your meal. Tree hugger has such an artsy-cozy atmosphere. 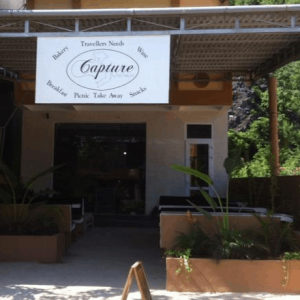 They have an ethical and sustainable business model, small artisanal shop and plenty of travel information in the restaurant. So you can read about the local area while you enjoy a locally sourced meal. A 3 course meal will run you less than $10. For those of you who need a cheese fix, 7th Heaven is the only place in town that makes their own pizza’s at their restaurant. Their service is customer oriented and the speak great English. I have a theory that their chili con carne has a dash or two of taste of home. Easy tiger has a order at the bar system for food, so its not like a restaurant where you are served by a particular person. Easy tiger always has specials and include alcohol in those specials. The menu is quite large and they do not skimp out on any cheese in the orders. Check out their happy hour deals between 3pm and 5pm. For example, you can get a 10 inch pizza and a local beer for less than $3. They have a book exchange as well as a small shop. Capture also has lovely homemade carrot cake! Omar’s restaurant has gigantic garlic naan breads, savoury curries and rich vegetarian dishes. It is quite rare in Vietnam to find featured vegetarian dishes as “vegetarian” here can often mean picking out the large pieces of meat in the dish and giving you the rest for the same price. Omar comes from India himself, so his food is authentic. The chai tea is a must-try. 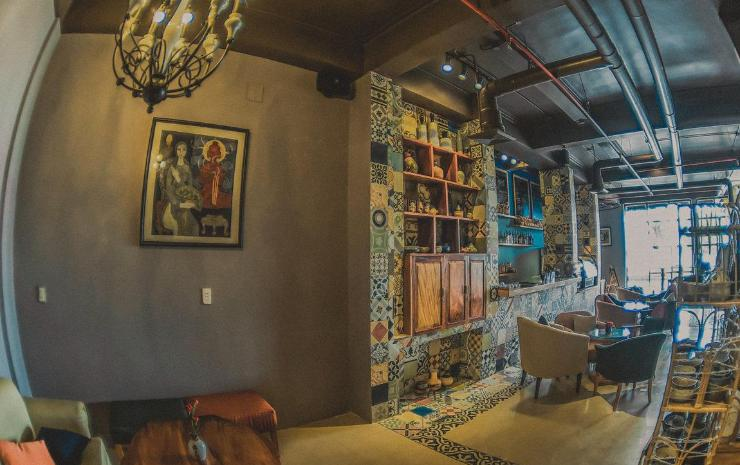 For those of you who are more adventurous, I suggest a number of dishes served around the city that are scrumptious and will cost you less than a couple of dollars. You will see signs for these foods everywhere. The best part of Vietnam, is that even though you can’t pronounce anything properly, they use the alphabet, so you can just memorize how the dishes are spelt. Pronunciation is the hard part, (saying hello- “xin chào”- can also mean “may I have some porridge” depending on the infliction you use). Luckily, the restaurants where these dishes are served all feature photos. 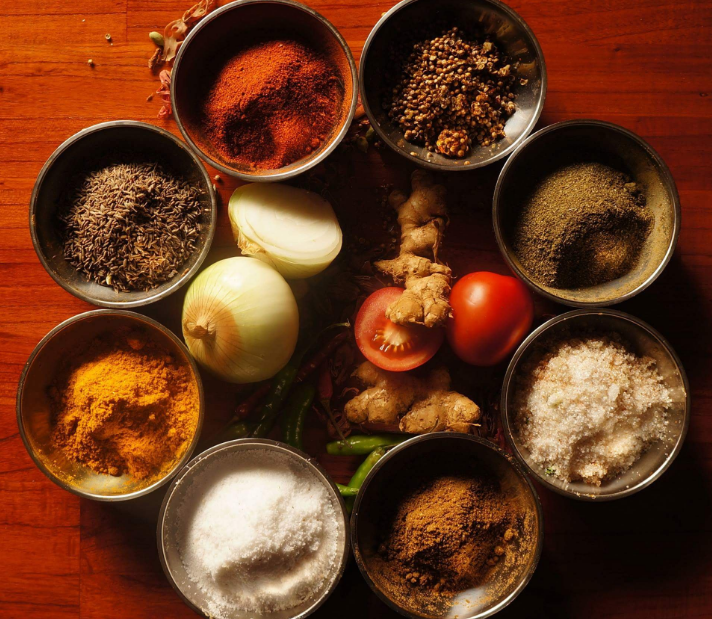 They also almost always have one or two specialties that you will see everyone in the restaurant eating, so you can simply point to anyone’s dish. 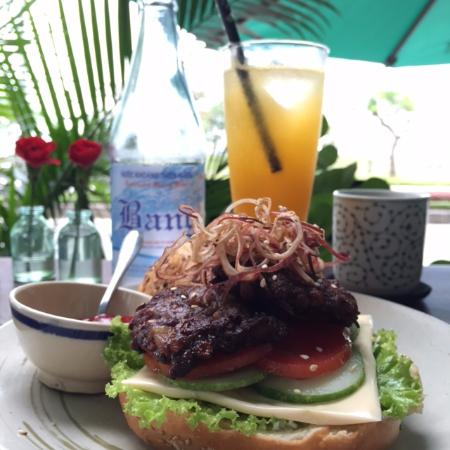 I will highlight my top 5 favourite must-try dishes. Any one of these dishes run from $2-4. 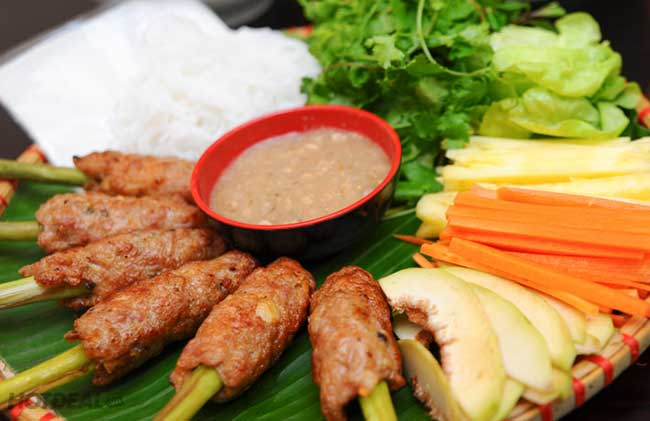 Nem lui consists of BBQ chicken skewers, pickled vegetables, lettuce and herbs. You wrap them up in rice paper, pull the skewer out, and dip them into peanut sauce. This dish will cost approximately $2.50. Ban Xeo is a crispy version of a fried “pancake”. 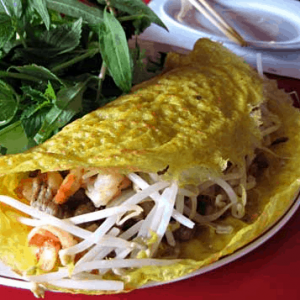 It has a crunchy flour outer layer and a savoury inner layer with beef, shrimp, bean sprouts, and carrots or other vegetables. 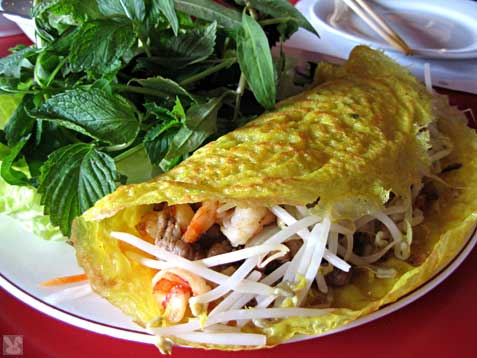 You add a piece of the pancake into a sheet of rice paper, along with lettuce, cilantro/mint, pickled carrots and/or parsnips then roll it up and dip it into a chili fish sauce or peanut sauce. 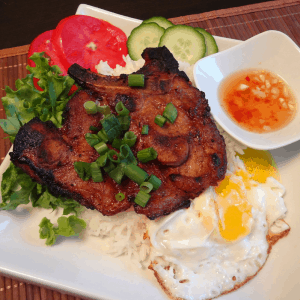 Thit nuong means grilled pork. 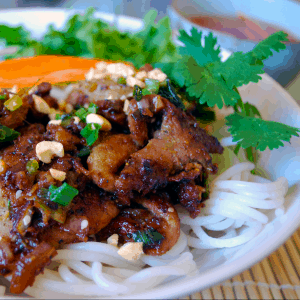 It is sweet and savoury and rests on top of the bun (vermicelli noodles). 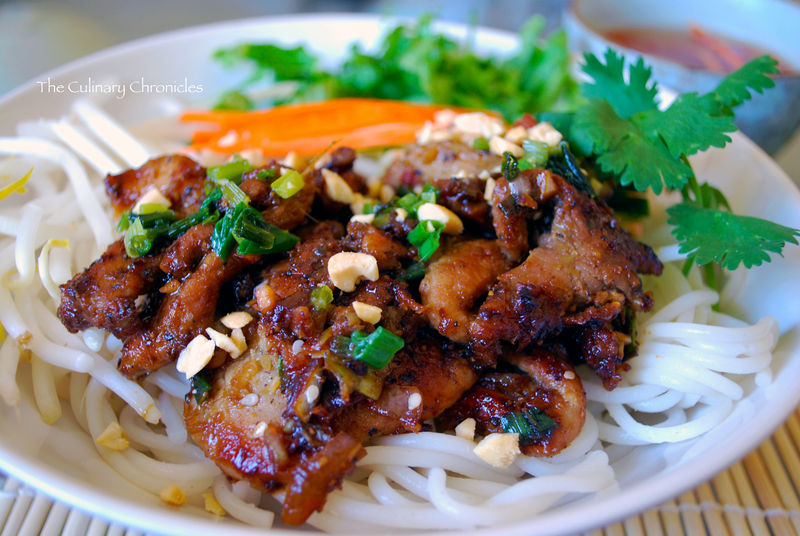 This dish can be found in Vietnamese restaurants in the west as it is quite popular. The mix of flavours from cilantro, peanuts, bean sprouts, and pickled carrots are a delightful mix. You can also simply order thit nuong by itself. 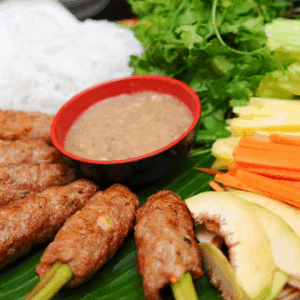 This dish could come with everything in the Nem Lui, except the chicken skewers are replaced by the BBQ pork. 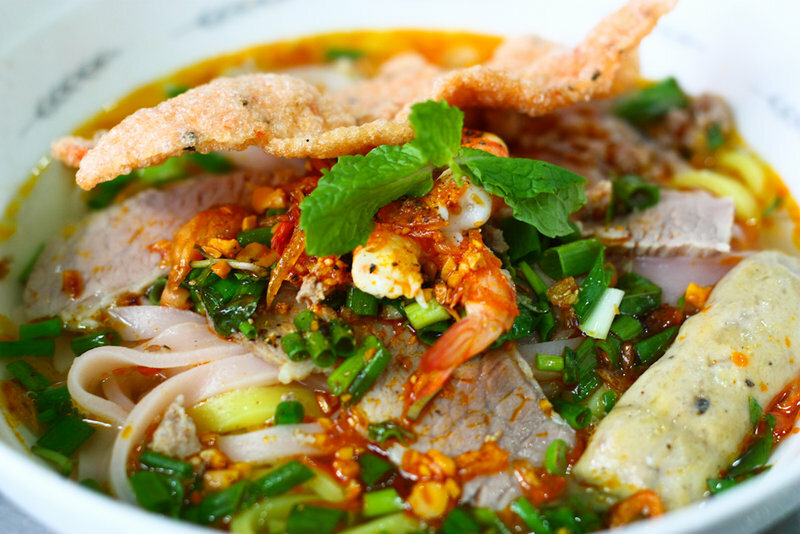 This dish originates from a province further south, but you can find it throughout Quang Binh province. The dish is made with a particular type of wide rice noodle that can include turmeric; giving it a yellowish colour. The half soup, half noodle bowl includes beef and sometimes shrimp. Its flavours arise from green onion, pepper, garlic, mint, and coriander and there is a small boiled egg for increased protein. You have the choice to add greens such as lettuce, chili, bean sprouts, etc. Each bowl of My Quang includes a crisp rice or shrimp cracker and lots of peanuts, making this a unique and incredibly tasty noodle dish. 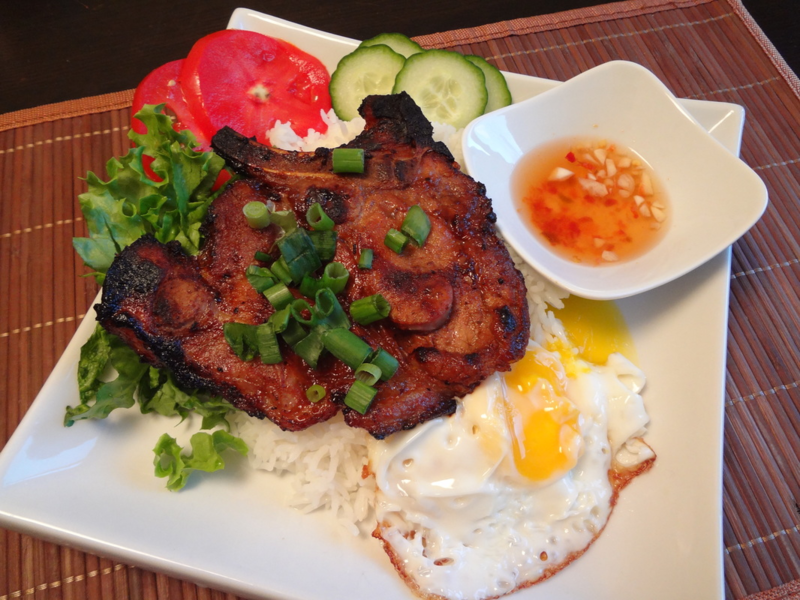 This dish name translates to “rice ribs eggs” and it is quite an adequate. 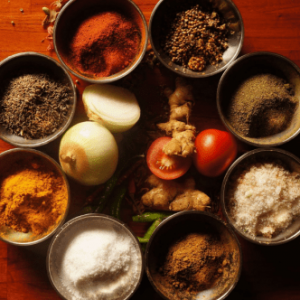 It is a perfect mix of several filling foods. It almost always comes with a small bowl of vegetable soup on the side. There is also always some vegetable, either garlic morning glory or aubergine as well as some fresh salad pieces on the side. The fresh homemade fish sauce with chili and garlic is the piece de resistance as far as these dishes go. I would personally recommend banh loc dau xanh (vegetarian ban loc). 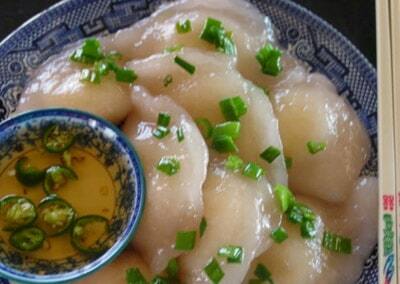 It is almost like a Vietnamese version of a pierogi or dumpling. The vegetation version is made from white beans, garlic, onions, etc. and wrapped up in a chewy rice dough and then steamed in banana leaves. You can also find this dish with meat and shrimp if you prefer to eat some seafood (banh loc). This one is not exactly a dish, but it has been a vice of mine here. 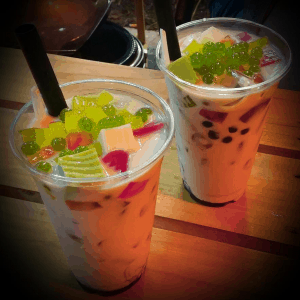 Popping tea is a twist on the classic bubble tea favourite. They come in a variety of flavours including green tea, taro, and chocolate. 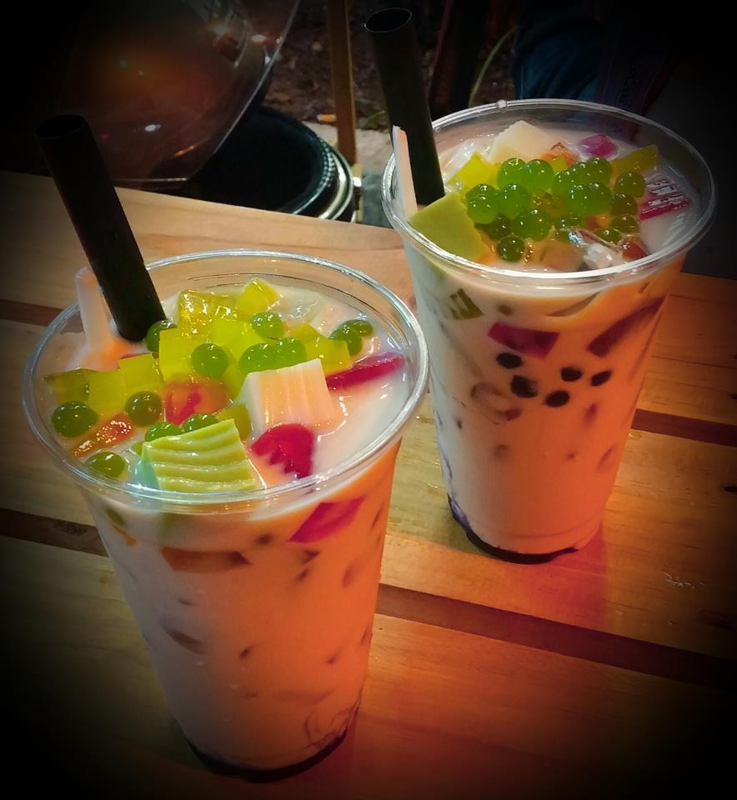 They still feature tapioca pearls, but they also include flavoured ‘popping bubbles’ and jelly squares that include all of the flavours available. Of course you can get it without all these features; it will be advertised as ‘milk tea’. One of these teas sell for under $1. 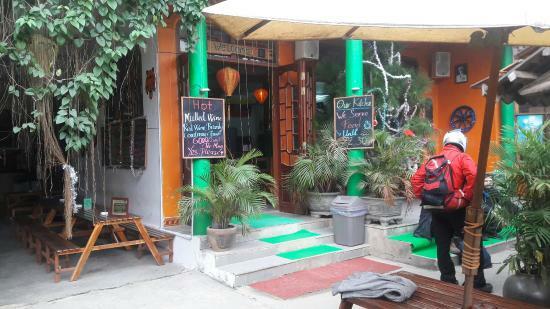 There is a popping tea location adjacent to Buffalo hostel in Dong Hoi.